The Polisario and Algerian intelligence services have taken the blow without flinching. The revelations made by a Mauritanian e-journal on the circumstances of the liquidation of the Polisario founder, El Ouali Mustapha Sayed, are so accurate that they leave no room for controversy. The website Akhbar Nass actually reported that the covered facts about the assassination of the first head of the Polisario in Mauritania have emerged in conjunction with investigations on another political murder that took place in Algeria. It is the murder of Kasdi Merbah, former head of the Algerian military intelligence services (DRS) in August 1993. The crosschecks made by Merbah’s family members who are still seeking track of the assassins of the DRS former head, led to confidences on the assassination of El- Ouali in June 1976. The decision to liquidate El-Ouali was reportedly made in the presence of Abdelaziz Bouteflika, who was then Foreign Minister. However, the assassination of the Polisario founder was not linked to his past when he was living in the Moroccan cities of Marrakech, Taroudant and Rabat. 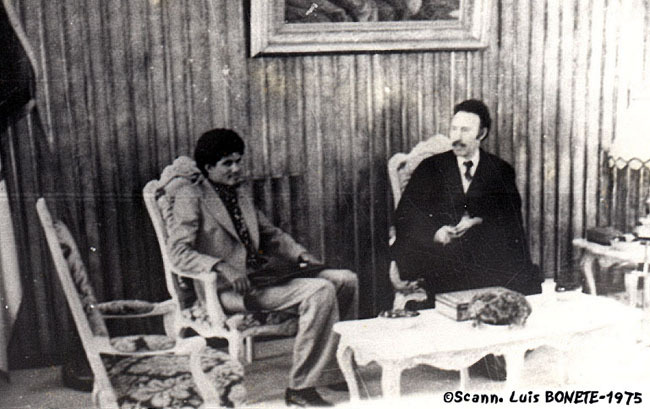 El- Ouali’s liquidation was rather the consequence of the contacts he had had, two months before his assassination, with members of Maa El- Aïnine tribe, an influential Sahrawi tribe. In April 1976, El- Ouali reportedly expressed his deep conviction that the solution of the Western Sahara issue had to be sought with Morocco and that he was ready for talks with Moroccan authorities. The Algerian intelligence services had not however missed El- Ouali’s contacts. A Cherif Messaadia, the man in charge of the Polisario dossier within the Algerian FLN, was especially interested in El-Ouali and kept an eye on all that he said or did. According to the revelations of the Mauritanian e-journal, El- Ouali’s fate was sealed at a meeting in Algiers which gathered around President Boumediene, Abdelaziz Bouteflika, Cherif Messaadia, Kasdi Merbah and Lieutenant Hoffman Slimane. The agenda was topped by the restructuring of the Polisario leadership and means to pull it away from the sphere of influence of Colonel . After he took knowledge of the report submitted by Messaadia and Slimane Hoffman about El- Ouali’s conciliatory intentions, Boumediene had reportedly been taken by one of his notorious rages and ordered the physical liquidation of the Polisario founder.